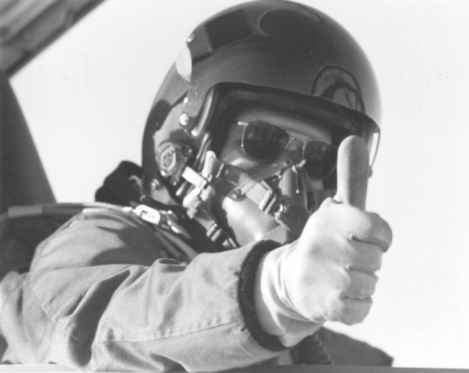 Musgrave dons the Hard Upper Torso of the Shuttle EVA suit during KC-135 training in November 1982. 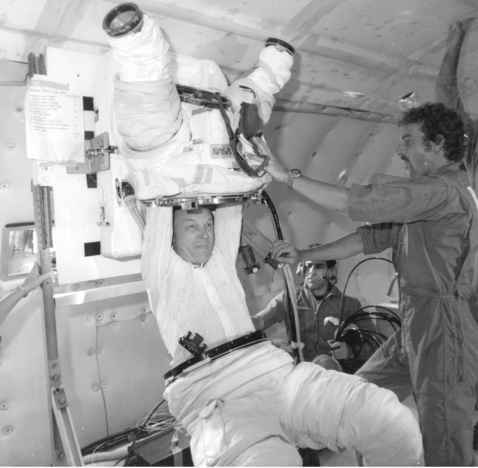 This "zero-gravity" exercise was to practice donning and doffing the suit under simulated weightless conditions. entry. The TDRS network would gradually replace the existing network of fifteen ground stations that gave only thirty per cent direct communication time with the Shuttle in any ninety-minute orbit. Three operational TDRS satellites placed 120 degrees apart in synchronous orbit would provide ninety-eight per cent real-time coverage each orbit. TDRS was also a vital element in the US/European Spacelab mission manifested for later in 1983 aboard STS-9 (Spacelab 1). This was a planned round-the-clock science mission over nine days. The second TDRS was manifested for launch on STS-8 and the third on STS-12. 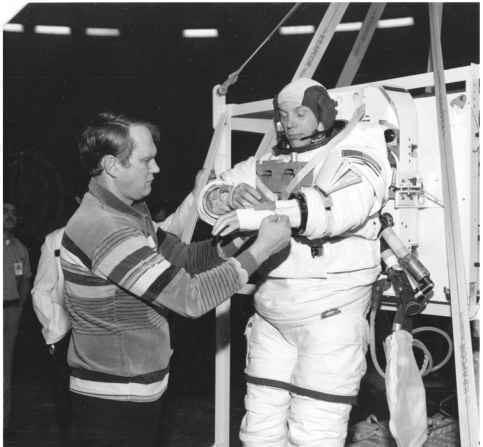 STS-6 Pilot Karol Bobko assists Musgrave during preparations for an underwater EVA simulation at the WETF at JSC. Musgrave stands on the platform that would take him and Don Peterson (behind Musgrave) into the pool to begin their simulation. deployment of the IUS carrying the TDRS-A satellite was achieved successfully ten hours into the mission. However, although the crew's operations in the deployment of the payload went without a hitch, the pre-planning sequence to place the satellite into operational orbit did not. The IUS first stage burned for 2 minutes 31 seconds to place the combination into its transfer orbit. The second stage should then have burned for 1 minute 43 seconds to place the TDRS in a synchronous orbit at 56 degrees W. However, an oil-filled seal deflated, causing the steering mechanism to malfunction. Only prompt action by the ground controllers saved the satellite as they quickly separated it from the erroneous IUS stage, far short of its planned orbit. Over the next fifty-eight days, delicate manoeuvres eventually placed the satellite on station at 41 degrees W, but with 370 kg of the 598 kg of propellant used, its operational mission was seriously compromised. The STS-9/Spacelab 1 mission was secure, but future IUS launches were put on hold as the problem was investigated. The IUS from STS-8 and STS-10 (a planned military satellite deployment) were taken off the manifest until the problem could be rectified. Aboard Challenger, after the TDRS deployment, the crew and vehicle performed flawlessly, including during the first EVA from the Shuttle in the payload bay of the orbiter. For over three hours, Musgrave and Peterson worked outside, clearly enjoying the experience. The crew also performed a number of mid-deck and secondary experiments and completed their mission with a 9 April landing on Runway 22 at Edwards AFB in California, after a flight of 5 days 0 hours 23 minutes 42 seconds and 81 orbits.